After several years, we at CatSynth are resuming our tradition of sharing wild cats on earth day. Those who follow our Facebook page are regularly treated to photos and videos of wild cats. We share a few favorites, along with some of our own. 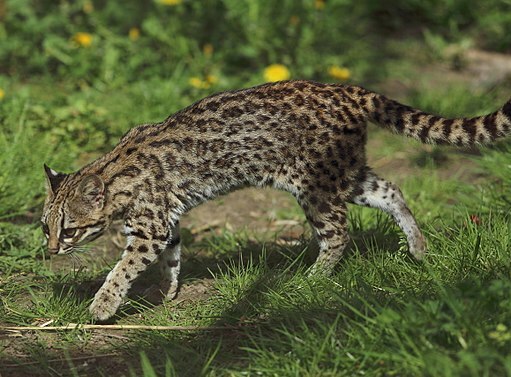 A personal favorite of ours is the fishing cat (Prionailurus viverrinus). It is unique in that is adapted for swimming and hunting in the water. The sleek fur, streamlined shape, and folded ears attest to this adaptation. 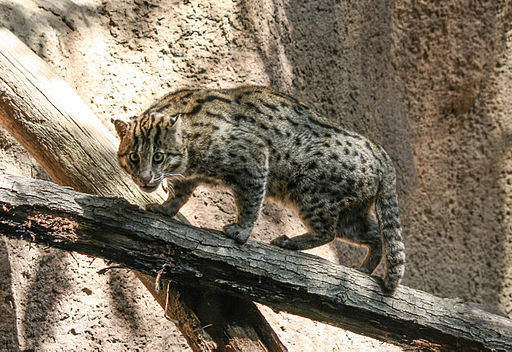 The fishing cat has discontinuous populations in rainforests of South Asia and Southeast Asia. It is listed as Vulnerable, primarily due to habitat destruction. The Greensboro Science Center in Greensboro, North Carolina, recently posted this video featuring a mother fishing cat teaching her kitten their aquatic heritage. Another lesser-known cat is the oncilla (Leopardus tigrinus). It is among the smallest of wild cats, similar in appearance to but significantly smaller than the well-known ocelot. The oncilla lives throughout Brazil as well as the highland tropical forests of Colombia, Ecuador, and Peru. There is even a recorded separate population in Panama. It is listed as Vulnerable in IUCN classification, mainly due (once again) to habit loss. Both of these cats and many others have a similar spotted look that works well in their forested environments. Our old pal the Pallas cat (Otocolobus manul), also known as the manul, is quite a different beast altogether. It has a squat shape, fluffy fur and a gray color that are suited to its cold rocky environment in Central Asia. Here is a manual I encountered at the Prospect Park Zoo in New York some years ago. More recently, we attended the Feline NightLife at the California Academy of Sciences, and got to see many wild cats courtesy of Safari West, including this beautiful serval. While not endangered, servals have been frequently been captured and bred as exotic pets. They do, however, remain wild predators and their domestic captivity usually goes badly for human and feline alike. 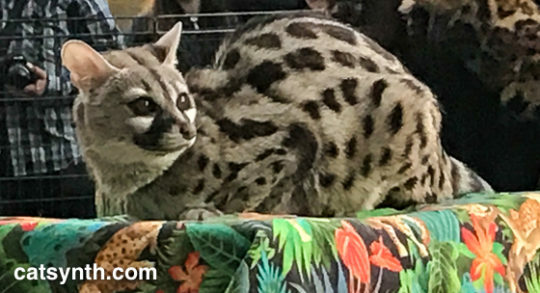 As our host from Safari West said, “they do not make good pets, but they will eat good pets.” Below is a “cat” that actually is not a cat at all, but a separate genus, the genet. If they had not told me, I might have guessed it was a fishing cat. Sadly, Safari West was affected by last year’s devastating Tubbs fire in Sonoma County. Several structures burned, and the co-founders lost their own home. Fortunately, most of the property was spared and the animals all made it through the conflagration safely, and Safari West reopened for tours and programs in late November. You can read more about their experience (and find out how to support them) here. We conclude with our friends at ISEC Canada, an organization dedicated entirely to the conservation of small wild cats. They have many projects underway, including a study of the black-footed cat, another lesser-known small wild cat from southern Africa. It’s esimated range covers parts of Namibia, Botswana and South Africa. The black-footed cat is adorable, and its face closely resembles many housecats. But once again, this is a wild animal and does not belong in a domestic setting. We applaud the work of ISEC Canada and other organizations who study and help to preserve them in their wild habitats. Today we look back at the recent art and fashion show featuring the work of Serena Toxicat. 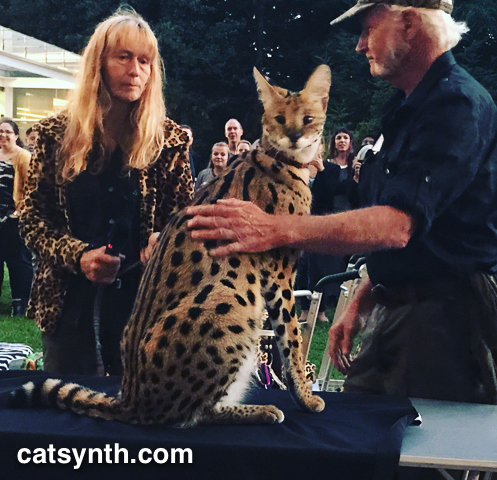 I was fortunate to be a part of this show as a model, and it was featured in Episode 9 of CatSynth TV. Serena Toxicat is a multi-disciplinary artist, working as a writer, visual artist, musician, and now a fashion designer – longtime readers may recognize her via our reviews of her band Protea. Her paintings were featured on the walls of Farley’s East in Oakland as the fashion show took place in the lobby. She also had her music, books, and cat-themed tarot cards on hand. One sees themes that repeat throughout her work in various media. There are of course the cats – I particularly liked the painting featuring manuls or Pallas cats – and felines reminiscent of Egyptian iconography. But there are themes running through as well with the bright high-contrast colors and dreamlike arrangements of forms. The feline, color, whimsy and spiritual dimensions are all of a piece and come together in her life experience as well as her outward creativity. The show itself was a fun experience. Each of us modeled two looks over the course of the evening, with more formal runway-style processions interspersed with more freeform dance sections. In addition to Serena and myself, the models included Ariel McEtchin, Gina Ghorbani, Charlena Verrette, Kristine Katalyst, Maya Imani, Sam Isis, and Jessa Nico. Although the art show is now over, you can see and learn more about Serena Toxicat’s work via her Facebook page. Every year on or around Earth Day, we at CatSynth dedicate our Weekend Cat Blogging post to the endangered wild cats of the world. There are 37 known species of cats, including the domestic cats. As those of us who share our lives with domestic cats know, they share a lot in common with their wild cousins, especially the closest wild species Felis Silvestris, otherwise known as the “wild cat.” Indeed, domestic cats are considered likely descendants of the African and Middle Eastern subspecies of the wild cat. Beyond the similarities, however, there is quite a bit of diversity among the species of small wild cats in terms of size, appearance and behavior. We have following the work of the International Society for Endangered Cats (ISEC) Canada over the past year, which has given us the opportunity to learn more about many of these cats and the efforts to protect them. Among ISEC Canada’s sponsored projects is the study of the Black-Footed Cat, which is found in southern Africa and is among the smallest of wild cat species. 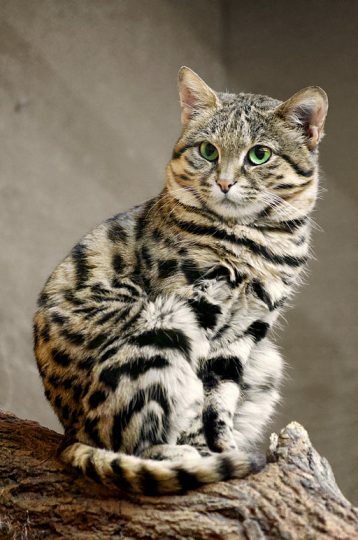 The Black-Footed Cat is considered vulnerable, with an estimated population of about 10,000. They have been among the lesser studied cats, so this current project will help us understand them and the threats they face better. ISEC Canada is also sponsoring a project in Argentina. Here they study the Geoffroy’s Cat. Although considered to be relatively widespread in open areas of South America, little is known about them. This project has helped researches learn about the Geoffroy’s Cat, and also the rarer Pampas Cat. This and several other great photos of felids of the Argentine Espinal can be found here. 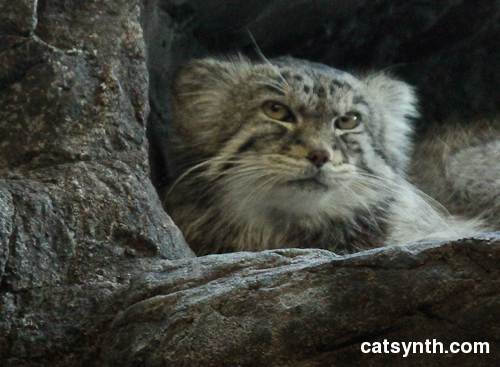 Over the past year, I have also become acquainted with another species, the Pallas’ Cat. Pallas’ cats are native to the high-altitude grasslands of Central Asia including Mongolia, western China, and parts of Russia and Afghanistan. Though this particular cat resides in the Prospect Park Zoo in Brookyln. 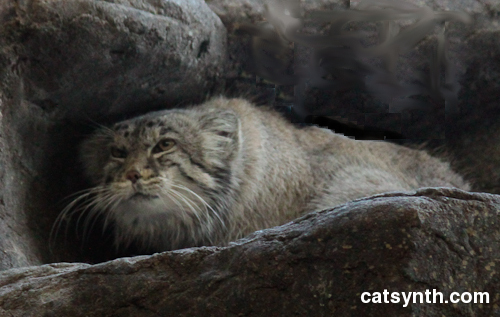 You can read about my encounter with the Pallas’ cat in this article. Pallas’ cats are about the same size as domestic cats, but have quite a different appearance suited to their habitat. Another very distinctive looking cat is the Caracal, with its black ear tufts. Caracals have a large range over much of Africa and the Middle East, though they are not often seen. They are not considered endangered, though their populations are smaller in North Africa than in the south. Another organization that works to preserve wild cats and educate the public about them is the Felidae Conservation Fund. They are based here in northern California, and one of their main projects is studying our local puma population. They are also involved in other projects, such as studying the Andean Cat and the Fishing Cat. The fishing cat is quite photogenic, as can be seen in the above photo by a member and supporter of ISEC Canada. (Click here to see more images.) Fishing cats are found in Southeast Asia, and are uniquely adapted to catching fish. They even have webbed front paws. Visit Fishing Cat Project (supported by the Felidae Fund) to find out more about their conservation. We conclude with another cat species that we have not featured in previous posts, the Rusty Spotted Cat. The rusty spotted cat is among the smallest of cat species. They live in southern India and Sri Lanka and appear to be at home in a wide range of habitats, from humid forests to open grasslands, and even in abandoned houses in densely populated parts of India. You can read more about them here. There is always more to say about the magnificent cats of the world than we can fit in one article. Please visit our previous wild-cat articles for more. And please also visit ISEC Canada, the Felidae Conservation Fund, and the many other organizations working to conserve endangered wildlife. Well, since it is Weekend Cat Blogging, one would expect to see a cat. And indeed there is a wild cat sleeping well camouflaged amongst the rocks. This is Pallas’ Cat, native to the high-altitude grasslands of Central Asia including Mongolia, western China, and parts of Russia and Afghanistan. This particular individual was not in Central Asia, but rather at the zoo in Prospect Park in Brooklyn. Pallas’ cat has a nice thick fur coat and, unlike the writer of this article, is well suited to colder climates. They are similar in size to larger domestic cats, and of course have many of the same characteristics. They hunt, tend to be solitary, and spend a decent amount of time sleeping. But despite the similar appearance, there is a lot of question about how closely they are related to other cats. They are currently not part of the genus Felis with domestic cats and related wild cats, but part of the separate Otocolobus (though this is subject to discussion). Pallas’ Cat is not on the endangered list at this time, but is listed as “near threatened” primarily due to habitat loss and illicit hunting and trade (one can only imagine that an animal with such a fur coat could be easily threatened by illegal hunting). There are efforts underway to help preserve these cats in their native territories, including programs in Russia and Mongolia. Follow the links for information on these efforts.